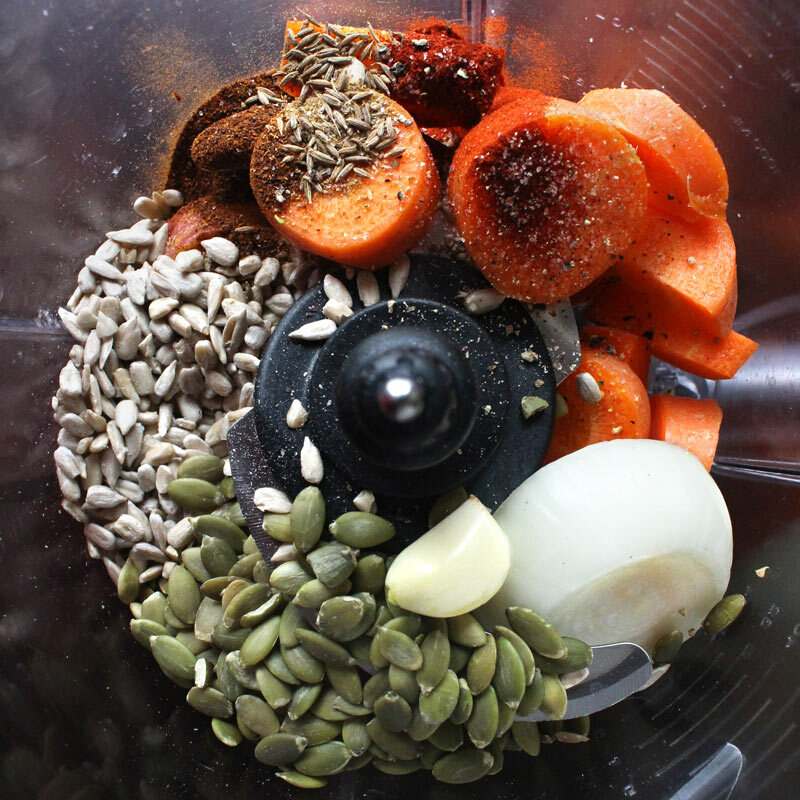 A simple nut-free raw vegan taco meat, made from basic ingredients; sunflower seeds, pumpkin seeds, carrots and a bunch of spices. I know a lot of you out there suffer from some kind of nut allergy, so this one is for you guys, and anyone else who is tired of nuts and their expensiveness. 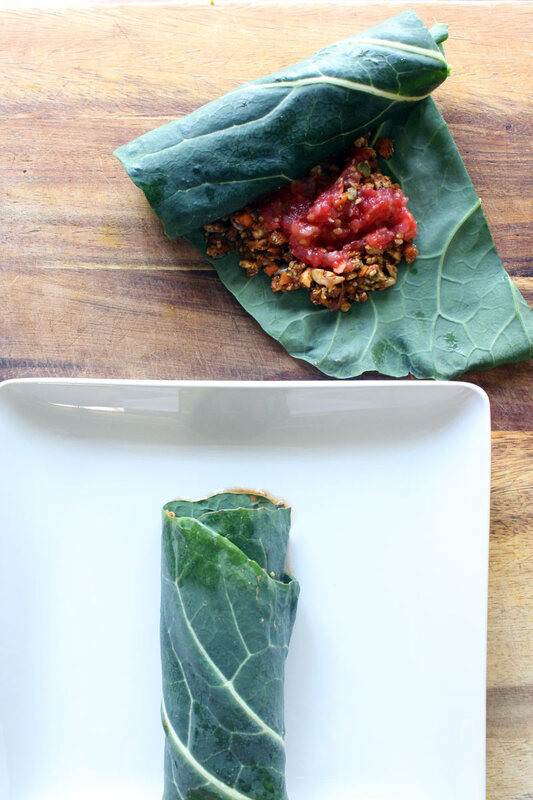 Raw vegan burritos is one of our core weekly meals because its quick, easy and I usually have all the ingredients on hand. It’s difficult to find a raw recipe that Dominick enjoys, so this recipe brings me comfort in knowing that we both like it, its good for us and it’s easy to make. 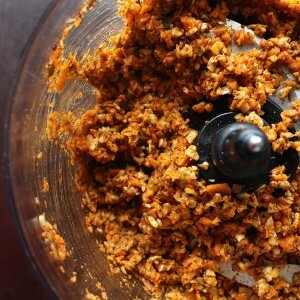 A bunch of seeds and vegetables mixed together may not sound too appetizing but when you add the spices you get that reminiscent taco flavor, with a similar texture. Regardless of the fact there’s no grease, it still satisfies my taco craving. For us the spices make the dish, we’ve experimented with many different bases, as long as you have the cumin, chili powder, smoked paprika, garlic and onion you’re in business! The spices in this mock meat add so much taco flavor, the only thing you need to worry about is the texture and umami if you want to make the dish more savory. Umami is basically savory flavors, and can be achieved best through this amazing magic mushroom powder, sun-dried tomatoes, or soy sauce/tamari. Honestly I like the simple fresh and spicy flavor without any umami at lunch, but at dinner I do crave the more savory ingredients. The good news is, you can taste this mock meat at any time to see if you like it as is, or if you need to add more savory flavors. For a good texture, you’ll need a solid base of root vegetable and a seed or grain. Besides carrots you could try kohlrabi, jicama, daikon radish, or another root that you enjoy raw. For a meatier consistency use soaked sun-dried tomatoes. This is one of those ingredients that I seem to always be out of, so I made it without and I still believe the spices steal the show, the tomatoes or mushrooms are just an added savory bonus. I recommend you let your imagination run free, you can use any type of seed, grain, veggie or spice you prefer; this is really just a good simple base to get you started. 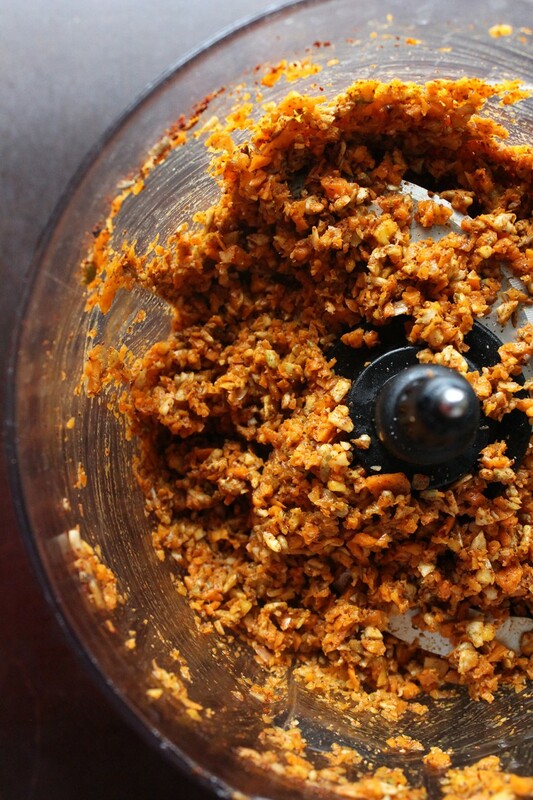 To prepare, all you do is process the ingredients in the food processor until it is your desired consistency. 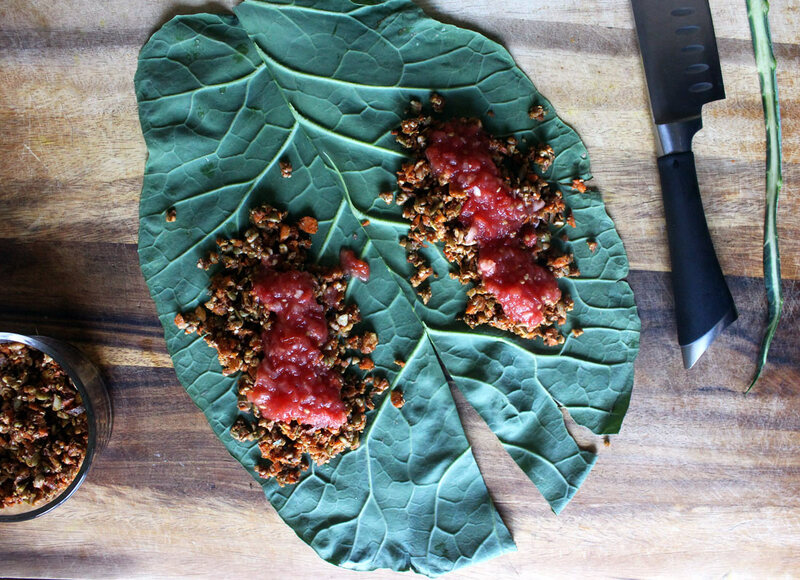 Raw vegan tacos are one of my favorite lunches to bring with me on-the-go, because it doesn’t need to be heated up, and the spices make it taste hot so you don’t miss the heat. But if you want to warm the dish up, I recommend adding rice and a slightly steamed flour tortilla. Below is a heartier burrito recipe that Dominick and I eat pretty much every month. 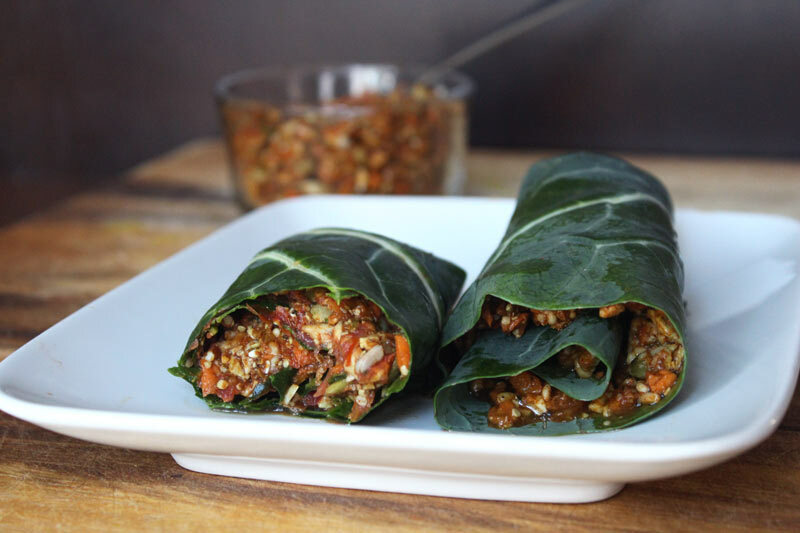 Any kind of wrap can be used, in this case I enjoyed a collard green. They are in season, so they are super sweet and delicious! What I really need to do is get Nicole’s homemade black bean salsa from the farmers market, it’s such a treat! What do you substitute salsa for in the winter?